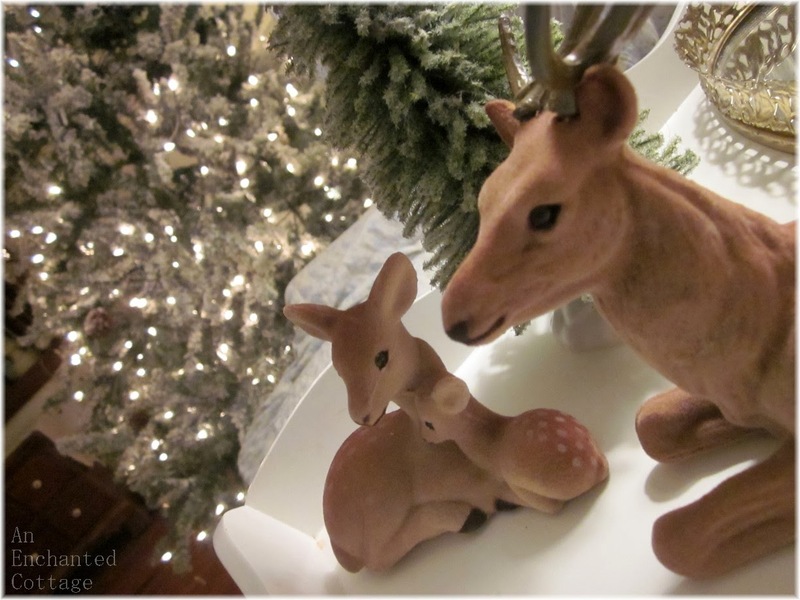 Don't you love this darling flocked deer family? I have just two things out for Christmas this year. ...and the flocked 'Craigslist' Christmas tree that we picked up this afternoon. There's a section of the tree that won't light. We're not sure if the lights are defective (it was supposed to be in excellent condition) or if we haven't found the plug for the last section of lights (it took us forever to find the others among all the flocked branches). 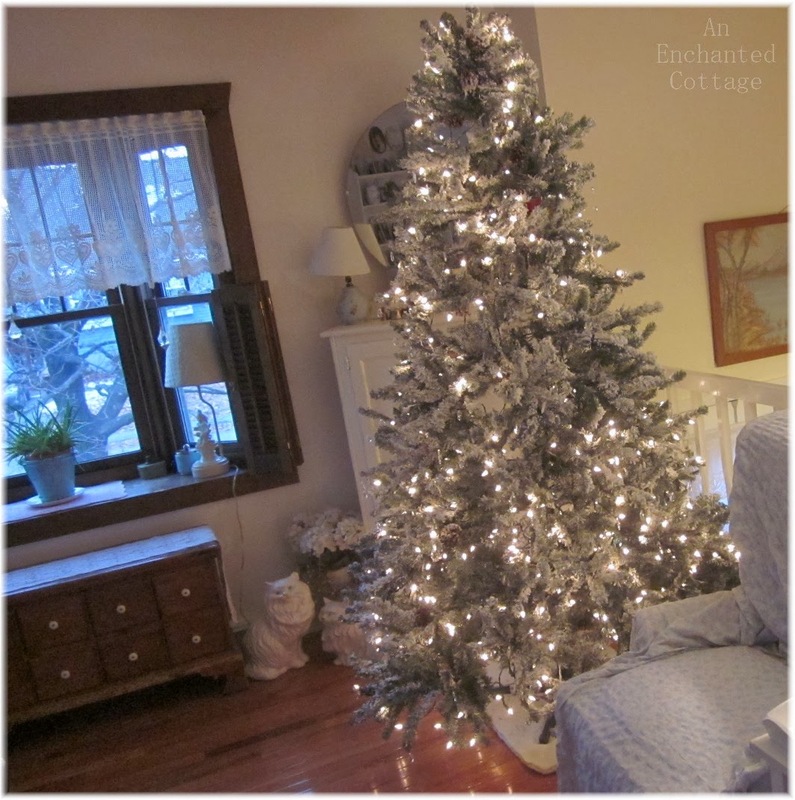 In any case, I've been pricing my dream (flocked) trees and 7.5' tall prelit flocked trees are so far out of our price range, it's not funny. So for the very reasonable Craigslist price of $50, I'm definitely not going to fret about a small section of lights not working! ... but I couldn't even fit half of our ornaments on it. So when I came across this full-sized flocked tree, I couldn't resist. The previous owner left all these beautiful prisms on the tree. Not so beautiful on the vehicles. 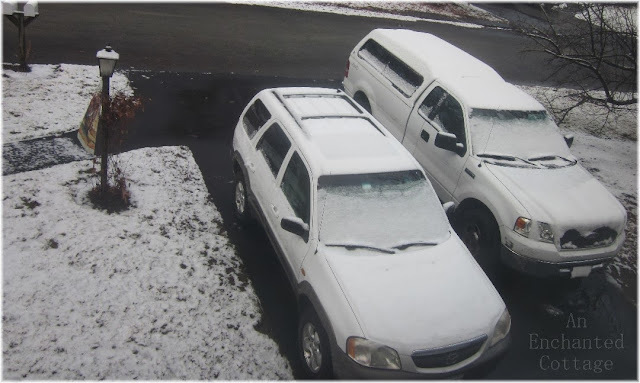 And tomorrow they're predicting freezing ice/sleet on the roadways during the morning commute. Yes indeed, winter has arrived. But on the plus side, along with winter comes Christmas! 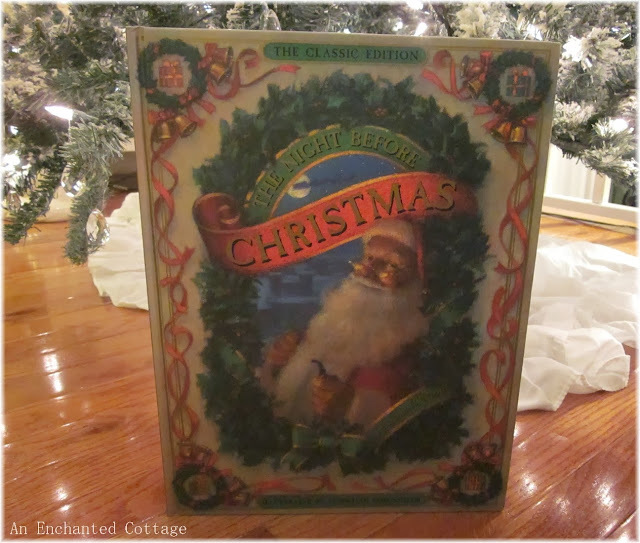 Just look at this beautiful version of The Night Before Christmas that I picked up while out thrifting! And I want one of you to have it! 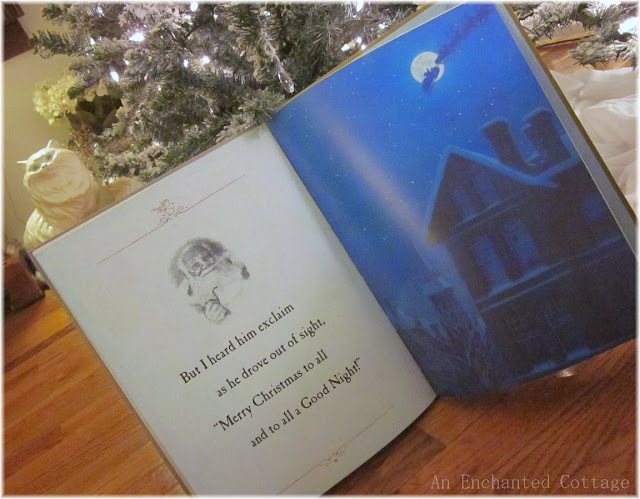 As some of you know, I have an extensive collection of Night Before Christmas books. Our family has been reading this story every Christmas Eve since our girls were born (back in the 80's!). And the tradition still carries on, with each of us picking a book from the stack and doing a 'round robin' reading around the table on Christmas Eve. ...so when I spotted this one, I knew that one of you would love it! It's an over-sized copyright 1995 edition, full of eye candy artwork!! To be entered into the drawing, just leave a comment before midnight, Friday December 13th. And if you don't have a blog, be sure to leave an email address so I can contact you if your name is chosen! Until then, "Merry Christmas to all, and to all a Good Night!" Your house looks lovely! The tree was such a find! and your deer family is precious- I love bringing out special - Christmas books every year too! You found a beautiful tree! If it is like ours, there will be a plug about half way done that will go directly to an extension cord. I wish mine was flocked! 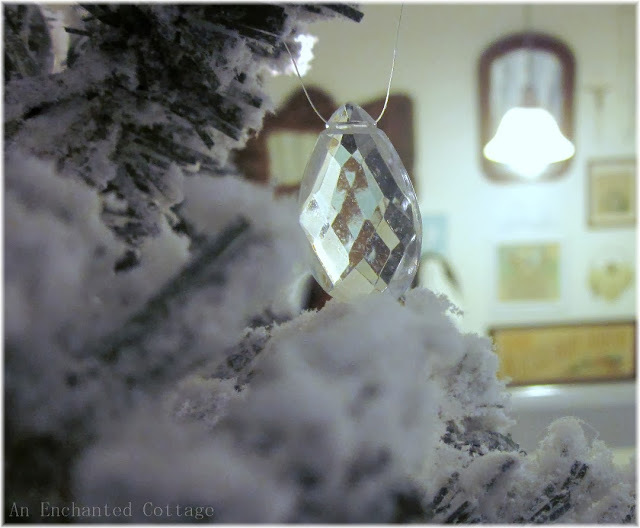 Your flocked tree is a beauty, it looks like snow on it and those prisms are nice too. 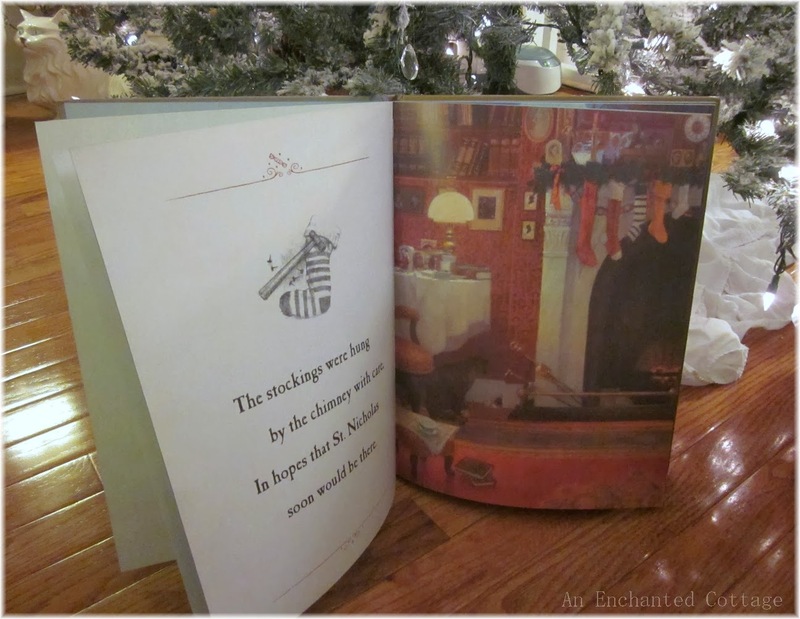 The book is beautiful, please do not enter me, so someone with little children can win it and it can become a family tradition to read it. 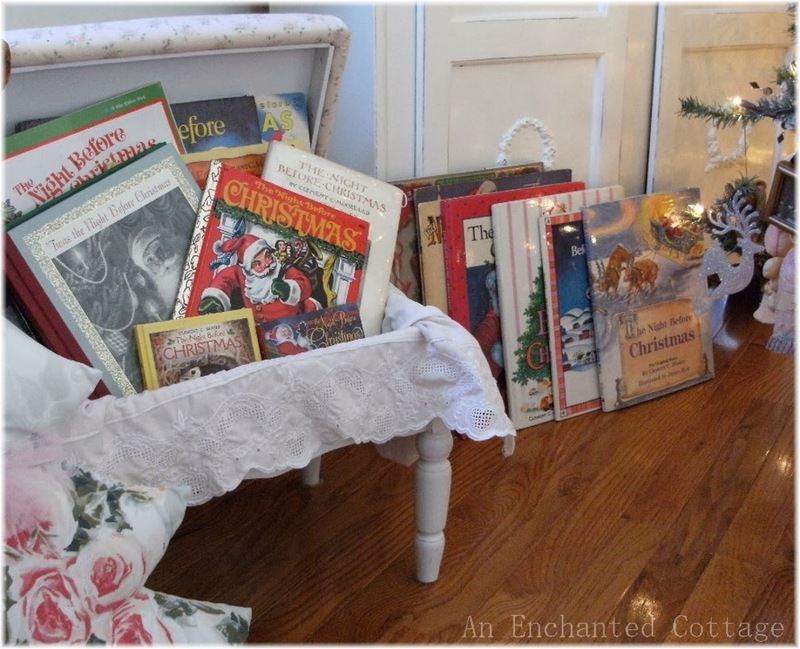 I'm adoring your Night before Christmas book collection. That is my absolute favorite Christmas book. 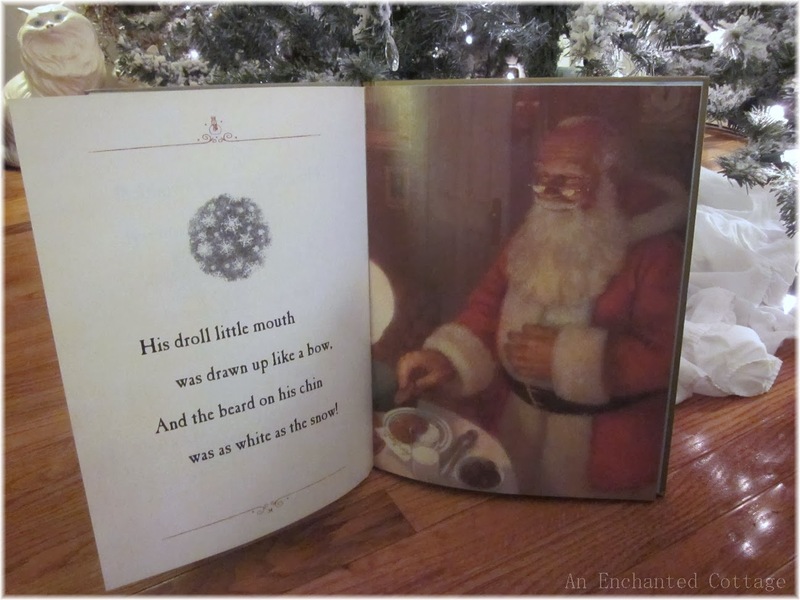 I have a Little Golden book that my 2nd grade teacher gave to each of us students, back in 1978, and I have kept mine all this time and started reading it to my kids on Christmas Eve when they were little bitty and I still read it to them! They are 17 and 13, it has become a Christmas tradition for us that is to precious to let go. I'm so glad they still enjoy hearing me read it to them. Thanks for sharing your pretties with us. Your home and tree look so festive. I would love to win the book. I have a very small collection of the books. Lovely tree and what a bargain!...and, please add my name to the list. I would enjoy the Christian Birmingham edition. I'd LOVE to win the book! I collect Christmas-themed books and would be thrilled to add this one to my collection. Your tree looks beautiful and I love the crystals on the tree. If you can't get all the lights to work you could always buy a small string to put on it. Lovely giveaway too. Donna, even tho getting a book would be wonderful. 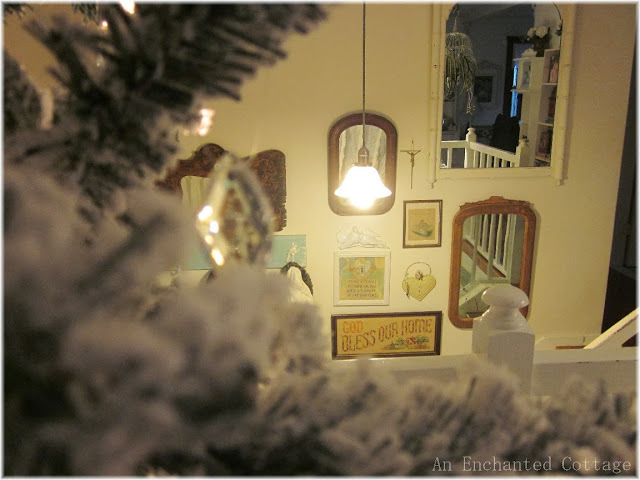 I am leaving a comment because of your flocked tree! when I saw the added prism's on there...my smile grew bigger. I think you got a wonderful deal and it looks so pretty in your home. I am in a 5th wheal and yes I decorated but I miss the big lovely tree's!!! 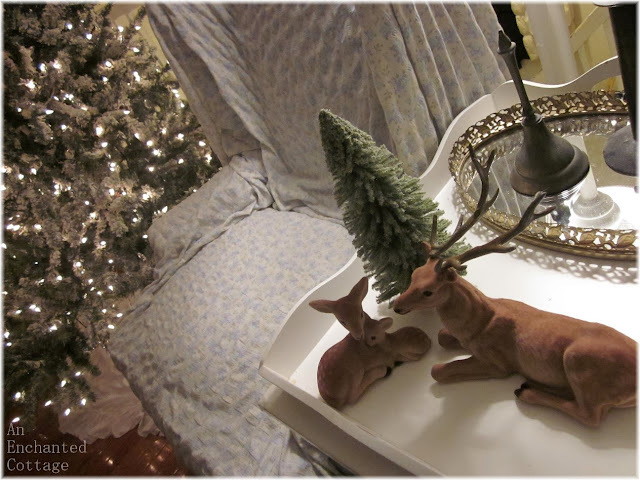 Love those deer and your "new" flocked tree! If need be, you can always add another strand of lights to it where the existing lights aren't working. It's unbelievable how much trees cost these days. And yes, please enter me into your drawing! I don't have a single Christmas book like that, so if I won, I'd at least have a collection of one, LOL! Tis a beautiful tree. Can't wait to see what Baby thinks (and does) about it! I love your tree! Your tradition of reading such a wonderful and traditional story is a great one. That will make awesome memories for your family! What a great Craigslist find!!!! I love the flocked trees! 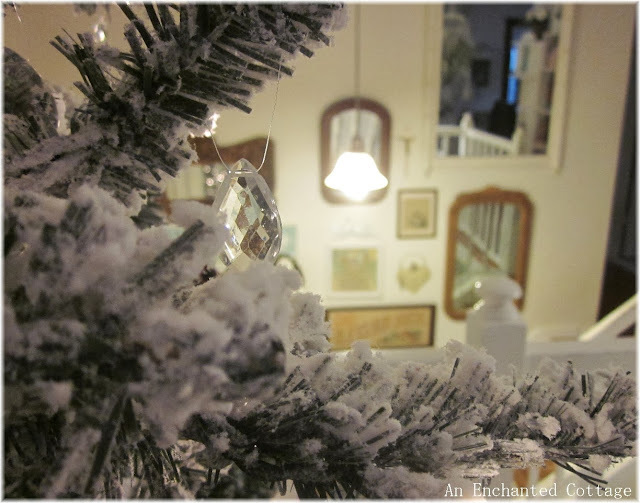 Your flocked tree is beautiful. 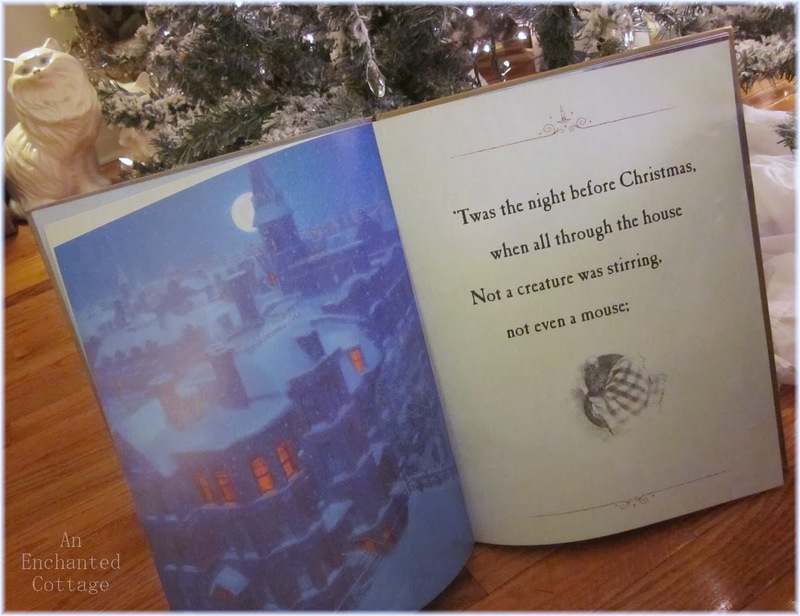 I just came across your blog and enjoyed reading about the tradition your family has of reading The Night Before Christmas. How sweet!! The illustrations in this copy are so lovely. So nice of you to offer this giveaway. Your tree looks beautiful! It has been so so cold. We haven't gone above freezing for over a week--really cold for Oregon! I love your flocked tree! I saw one at Goodwill recently and wish I had bought it now that I've seen yours. Your house is lovely! Lovely tree and definitely a great find! You may eventually find the light issue can be resolved. Please don't enter me in the drawing...I'd rather someone with children have the wonderful book. You had me at "flocked deer."